Ever since it finished airing last September, I’ve continued to hear good things about Love Lab. After finally having the chance to watch the entire 13 episode run, it’s easy to see why. The series follows a group of girls in the student council at Fujisaki Girls Academy as they conduct “love research” and try and figure out how to get a boyfriend. What follows are some humorous situations that are driven by some great characters, and if you’re a fan of this style of lighthearted, comedy focused anime you won’t want to miss this one. The main character of Love Lab is Riko Kurahashi, a student at Fujisaki Girls Academy who has a bit of a tomboyish personality and a tendency to get into trouble. While she often laments about not being popular, early on in the series Riko is unaware that her wilder personality has made her very popular with the underclassman. At the opposite end of the spectrum is the president of the student council, Natsuo Maki who is seen as a model student and the “Princess of the Academy.” Riko quickly discovers that isn’t necessarily true behind closed doors, as she is asked by a teacher to take some papers to the Student Council and opens the door to find Natsuo kissing a body pillow. One of her main interests is to learn about romance, and she quickly asks Riko if she’s an expert in love. Riko lies and says she is, and is forced into joining the Student Council to help Natsuo keep her secret and assist her with her love research. Right from the start Love Lab had me hooked, as the pairing of Riko and Natsuo works perfectly. It doesn’t take long for the two to become friends, and Riko often acts as the one capable of shutting down some of Natsuo’s downright delusional ideas about romance. Some of the “simulations” that the two go through in the first episode in an attempt to learn more about romance had me laughing more than I have at an anime in quite some time, and made me want to keep watching to see if the writing could keep it up. It doesn’t take long before an additional three characters are introduced, bringing the total closer to the standard format for a slice of life/comedy anime. I was initially worried that these three might not be able to offer the same level of humor and personality, but they did manage to win me over. The first girl besides Riko and Natsuo we’re introduced to is Suzune, an extremely shy girl who is the secretary of the student council. Initially it didn’t seem like her character was going to add much to the series as she’s the stereotypical shy type that’s stuck in the background behind the others, and this did end up being the case at times. But once Suzune became more comfortable with the others in the student council and got drawn into some of their delusions about love she comes out of her shell a bit and does provide some amusing moments. The other two, Yuiko and Sayori, start off as enemies of the student council as they both were kicked out by Natsuo for various reasons, but after attempting to sabotage the love research they end up right in the middle of it. Sayori pleasantly surprised me, as rather than having the sweet/delusional personality of Natuso or the tomboyish nature of Riko she was downright mean at times and once she figured out that Riko wasn’t being truthful about her love experience tries to use it to tease her a bit. Strangely enough, even with this personality Sayori’s the only one who has experience with a boyfriend, though the circumstances behind it are as hilarious as the delusions of the other characters. Yuiko’s the only one I felt the series didn’t really expand upon enough, as she’s a louder, brash girl that sometimes plays the tsundere character type but aside from that there isn’t too much about her that particularly stood out to me. With this cast of characters assembled, Love Lab goes for a looser plot line that focuses on plenty of random comedic moments. It doesn’t come off nearly as random as Azumanga Daioh, as the episodes do ultimately focus on the five girls making progress with their love research and trying to disguise what they are doing from the faculty at the school. But there is a sense of character progression as most of the main cast seems to have grown a bit from when they were first introduced, and that helped me care about them in between the comedic bits. When the final episode comes to a conclusion it does feel like the love research efforts are still just getting started and there remains plenty of room for a potential second season, but even if the studio chooses to end things here it’s the type of anime I could see myself returning to further down the road. Love Lab’s animation was handled by Dogakobo, and seeing as they have done a number of similar series (YuruYuri, GJ-bu etc.) this one has a very familiar feel. There were quite a few sequences that reminded me of YuruYuri in particular, as Love Lab has the same tendency to exaggerate reactions with super deformed characters and silly facial expressions. It isn’t necessarily the type of animation that is going to wow the viewer, but the lighthearted look and feel fits the storyline and characters perfectly and there is just enough pizazz added to the slapstick scenes to make them pop out and grab your attention. Love Lab remains consistent in its animation and I never noticed any sequences that made it seem like Dogakobo was cutting corners, making this another anime I have seen from a studio that has a knack for more light-hearted fare. As I mentioned earlier, one of the main reasons Love Lab is so enjoyable is because of how well the pairing of Riko and Natsuo works. The two voice actresses behind the characters definitely sell the roles and have the type of chemistry that’s vital for the leads of an anime to possess. While I’ve noticed a lot of slice of life and comedy anime series that have the same actresses in lead roles, Love Lab featured some newer ones that I hadn’t come across before or had only seen in small supporting roles in other shows. They seemed quite capable of stepping up for lead roles this time around though, and the cast as a whole did a great job (although I think it’s worth mentioning I really thought the voice actress for Suzune was the same as Hanayo from Love Live! but they just must just sound really similar). The opening and ending themes are also sung by the members of the lead cast, which is once again the case with just about every anime in this genre. They’re both light hearted pieces but I did find that the ending stuck with me a bit more than the intro, and neither one had the staying power as some of the other opening/endings from anime I have watched in recent years. On the surface it appears like Love Lab might be another comedy/slice of life simply cashing in on the “high school girls being silly” craze that has been around for quite a few years now, but this series has what it takes to stand out and showcases a quirkier side that gives it a feel of its own. The lead cast made an immediate impression on me and the slapstick nature of the humor didn’t feel stale by the end of the show, which makes a significant difference. 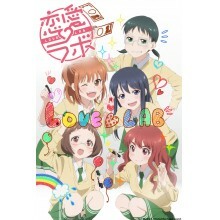 Love Lab isn’t going to change your mind about this particular genre of anime if you haven’t been crazy about it in the past, but if your tastes are similar to mine and you’re up for another quirky series that makes you laugh and smile throughout this may just become a new favorite.